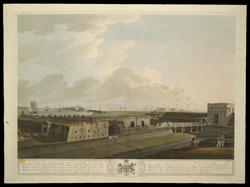 Aquatint with a view of Calcutta from Fort William, from a set of prints published by Edward Orme in 1807 and part of King George III's Topographical Collection. The East India Company established a fortified trading station in 1690 along the Hooghly River on the east coast of India. This spot, formerly the site of small villages, then expanded into the city of Calcutta, which by 1773 became the effective capital of British India. The town was originally clustered close to the fort for defence. However in 1757, it was decided to rebuild it in Gobindpore, south of the trading settlement. New arrivals sailing to Calcutta passed the octagonal fort before reaching the city. They were often impressed by the approach. John Prinsep wrote in 1771, 'The Stream seemed to widen as we proceeded and straight before use we beheld a stately forest of masts, vessels, an immense city and the bustle of commercial business'.